Safety Pins could help make the community more safer. Home 2017 March 28 Safety Pins could help make the community more safer. I believe that the safety pin movement could potentially help this community. With all the hatred going on in the world, all we need is a little gesture of peace and something good to come out of everything that’s happened. Since the Trump elect, things have gone haywire. Laws have been passed left and right and the consequences for it is astounding, but mainly it targets people of color, women, and the members of the LGBT community. Large amounts of people are scared for their lives now that their country is ran by someone who wants to take away the rights of that many people. 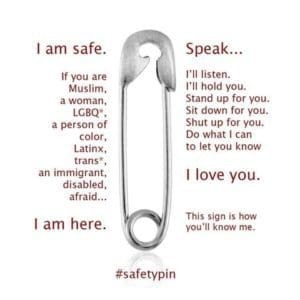 The safety pin movement provides a good source of support and it is not embarrassing or stupid to show that you’re not a threat to some people and you’re here to help. After the president got into office, there had been many counts of racist graffiti, violent hate crimes, (also not letting people from other countries back into the country once they’ve left) and lots of sexism,more than usual since our president likes to make remarks like grabbing women by her privates and many more things that can be added to the list of why he makes people uneasy. Wearing a safety pin is not harmful, it just shows that some people aren’t with what this president is preaching and it goes alongside the Women’s March that millions of people attended around the world as if it was a giant reassurance that nobody was alone in this situation. Wearing a safety pin is nothing compared to what people could be doing, making signs and protesting is also an option, but just wearing the pin isn’t harming anyone and that’s the whole point. Not to be harmful. To support the minorities and be a shoulder for them because we know not everyone will be and that’s the sad realization in Trump’s America. It’s not a crime to want everyone to feel safe in what they call their home. Safety Pins could help make the community more safer. by Hannah P. is licensed under a Creative Commons Attribution-ShareAlike 4.0 International License.